The mission of the Burt Lake Watershed Planning Project is to protect and enhance the water quality of Burt Lake and its tributaries by reducing current and future polluted runoff. The planning committee was composed of a variety of local stakeholders, some of which included the Burt Lake Preservation Association, Tip of the Mitt Watershed Council, Cheboygan County Road Commission, Conservation Resource Alliance, Little Traverse Conservancy, and Northeast Michigan Council of Governments. In addition to those that regularly attend the planning meetings, a wider range of stakeholders invited to the meetings. These included township officials, health departments, the local tribe and county commissions. 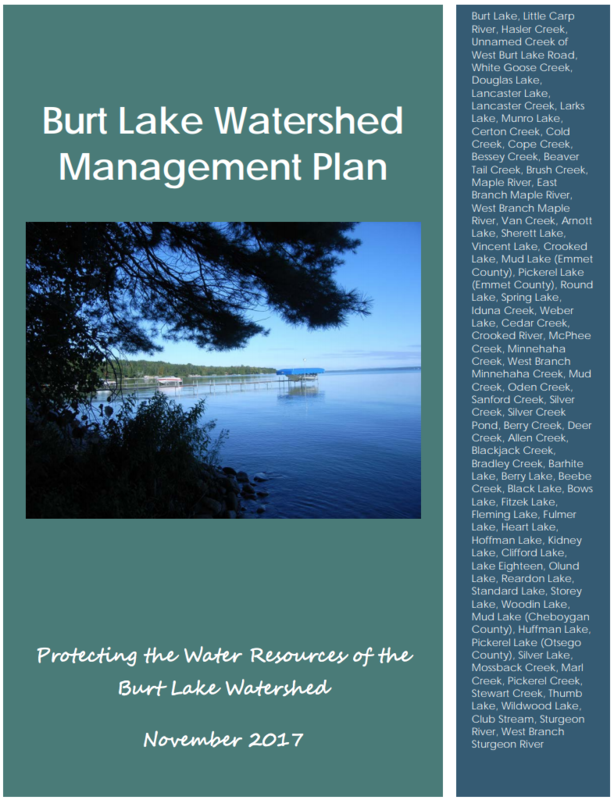 To view or download the Burt Lake Watershed Management Plan, click here. Tip of the Mitt Watershed Council is a 501(c)(3) nonprofit organization. Every effort has been made to ensure the accuracy of information herein; however, it cannot be guaranteed. Unless otherwise noted, all contents of this website are property of Tip of the Mitt Watershed Council © 2019. All rights reserved.